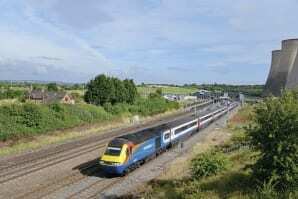 The classic lines of an East Midlands Trains HST after receiving the Best Impressions treatment. The lines of the livery contrast with the shape of the front of the train, and the orange stripe connects the coaches together to create the complete train. The railway convention of an all-yellow end has been challenged to allow integration into the livery, rather than as an add on. No. 43060 leads a London-bound train away from East Midlands Parkway. STEVEN KNIGHT MEDIA. NOTHING generates more debate in the transport industry than livery and branding. Everyone has a view and there are dozens of professional companies that claim they can produce outstanding branding and liveries every time. Everyone in a business, especially railways, from boardroom to platform, will claim to be an expert in design. Ray Stenning and his team at Best Impressions are the experts, not just in design but in transport design. Ray’s career spans more than 40 years and while his design roots are in the bus and coach industry, the privatisation of the railways in 1996 opened more doors. This was not surprising as the bus and coach groups that he has worked for were at the forefront of successful rail franchise bids.